The present Kingsdon Parish Council were elected in 2015 and sit for a term of four years. We usually meet on the second Thursday of every month in the village hall. The parish council notice board is outside of the village shop. The quickest way to raise an issue is to speak to a councillor. Each has volunteered to look after particular issues and these are listed with the contact details of each councillor below. If you are not sure who to contact ask any councillor or the clerk for advice. There is also a Parish Councillor Surgery at the village shop each month. The Parish Council is supported by the Parish Clerk and an independent Responsible Financial Officer. Planning applications have to be considered by the Parish Council within a specified time-frame and these meetings are also open to the public so look out for notifications. The Parish Council makes recommendations to the District Council Planning Authority as to whether the application is considered acceptable, conditional, or otherwise. The Government has introduced a Transparency Code for local councils and smaller authorities, with a turnover not exceeding £25,000. Kingsdon Council fits into this category, so the Parish Councillors will publish annually, no later than 1st July each year, various items of financial information as required by the Code. All information required to be made public can be found at the end of this page together with the Standing Orders of the council and other important documents, such as the most recent Parish Plan. 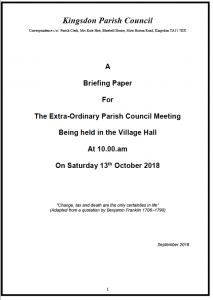 Briefing Document prepared for the Extra-Ordinary Parish Council Meeting 13th October 2018 – Click the image to the left to download. 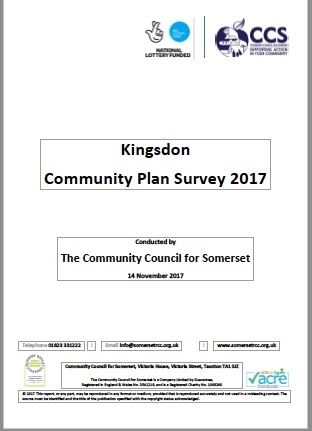 The Parish Council are pleased to announce that the results of the recent survey have been received prior to Christmas. A village meeting to give a full presentation and begin the development of an action plan response will be held early in 2018.